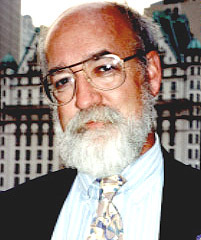 The philosopher Daniel C. Dennett is interested in consciousness, and his view of it, similar to that of Minsky's, is as high-level, abstract thinking. He is known as the leading proponent of the computational model of the mind; he has clashed with philosophers such as John Searle who maintain that the most important aspects of consciousness  intentionality and subjective quality  can never be computed. He is the philosopher of choice of the AI community. In his more recent work, he has turned to what he calls "Darwin's dangerous idea"; he is squarely in the ultra-Darwinist camp of George C. Williams and Richard Dawkins, and he has with great energy mustered a serious critique of the scientific ideas of Stephen Jay Gould. "Dan Dennett is our best current philosopher," says Marvin Minsky. "He is the next Bertrand Russell. Unlike traditional philosophers, Dan is a student of neuroscience, linguistics, artificial intelligence, computer science, and psychology. He's redefining and reforming the role of the philosopher."